Superman #31 Review – AiPT! “Breaking Point” gets off to a great start. Superman fighting Slade Wilson/Deathstroke sounds like an exciting prospect, as Big Blue continues his “Fighting Other Heroes’ Villains” tour in Superman #31. After a disappointing two-part story that included Green Lantern’s arch-nemesis Sinestro, James Bonny takes Superman to The Terminator. Thankfully, “Breaking Point: Part One” is the start of a potentially much-better story. Rather than just throwing Supes and Deathstroke together and let them fight for 20 pages, Bonny provides a really interesting story that gets them together. For the first time in a long time (at least in Superman), Lois Lane gets to be a journalist. After seeing the aftermath of Deathstroke’s violence in Bolivia, she convinces Perry White to let her set up an interview with the killer. I’m not sure I’d have the confidence to pitch that to an editor, but then again, I’m not friends with Superman. This is a very well-written issue, reminiscent of a Superman world without Jon and the overbearing weight of Superman worrying about being a good parent. That story has run its course, so Bonny doesn’t have to deal with that burden. The result is a really excellent story that puts Lois in front instead of Superman. Seeing Lois actually work as a journalist is almost as exciting as seeing Batman really be a detective. However, the book doesn’t include much of Supes and the fight advertised on the cover hasn’t come to fruition yet. Artist Tyler Kirkham reunites with Bonny after they both worked on the 2014 Deathstroke series. His art is fantastic, with a story that provides plenty of action and a dynamic layout. 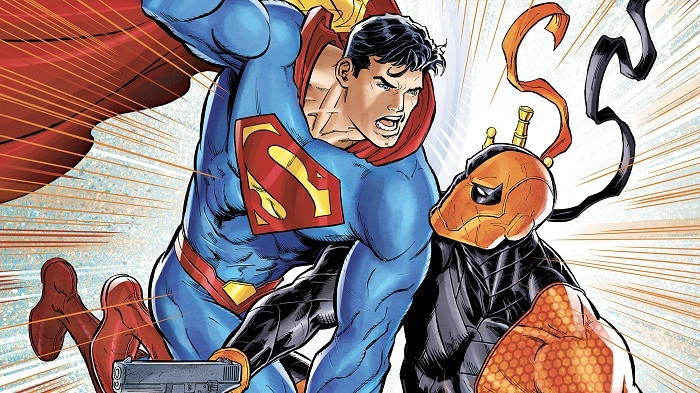 Deathstroke is as imposing as Superman thanks to Kirkham’s art. “Breaking Point” gets off to a great start, and hopefully the ending in two weeks won’t feel rushed. The story isn’t as eye-opening as what’s going on in Action Comics right now, but it’s just as fun. The two-part "Breaking Point" delivers on the promise of Superman vs. Deathstroke, while also giving Lois more to do than be worried about Superboy. Lois Lane gets to be a journalist! The art by Tyler Kirkham is fantastic. It's nice to see a Superman story without Lois and Supes obsessing over being parents. There's not a heck of a lot of Superman in this issue and the fist-fight promised by the cover doesn't come to fruition... yet.